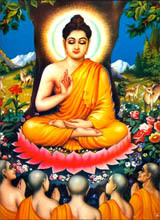 In order that all my sins, accumulated from evil deeds done physically, verbally and mentally, may be eliminated and excused, I raise both folded hands up above my forehead, worship, honour, greet, and humbly pay homage to the Three Precious Jewels of the Buddha, the Dhamma and the Samghā; once, twice, thrice I pray, O My Lord, Sir. By this act of salutation may I be excused forever from the four Apāya, the Three Kappa, the Eight Ahaṭṭkkhaṇa, the Five Verāni, the Four Vipatti, the Five Vyasana, Diseases; and at the final existence may I attain Magga, Phala and Nibbāna. O My Lord. Sir. Buddhaṁ pūjemi = I worship the Enlightened One. Dhammaṁ pūjemi = I worship the Doctrine, the Law. Samghaṁ pūjemi = I worship the Order of Samghā. Okāsa means the location for the performance of obeisance, adoration, worship and paying respect.